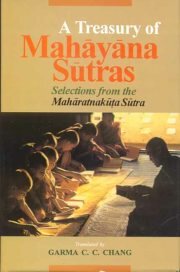 The Maharatnakuta Sutra is one of the five major sutra groups in the Mahayana canon. Of the two great schools of Buddhism, Mahayana has the greatest number of adherents worldwide---------it prevails among the Chinese, Japanese, Koreans, Tibetans, and Vietnames------and contains within it a number of movements, notably Zen which have been of growing interest in the West in recent decades. Yet despite this increased attention and enormous following, translations of Mahayana scriptures have been scarce and fragmentary; clearly, a comprehensive translation of a major work within the canon was called for. Garma Chen-chi Chang is Emeritus Professor of Religious Studies at the Pennsylvania State University and a renowned Buddhist scholar. His books include The Buddhist Teaching of Totality and The Practice of Zen, as well as his English translation of the Tibetan classic, The 100,000 Songs of Milarepa.